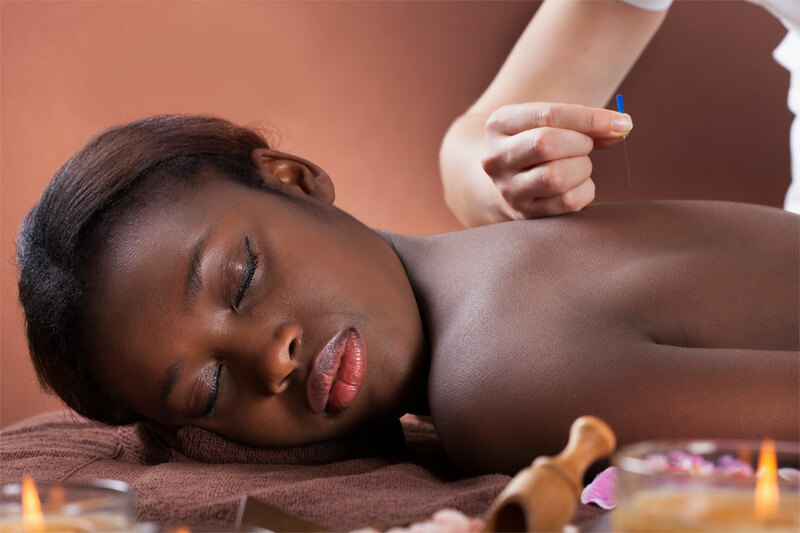 Acupuncture therapy is a form of medicine used to restore the body naturally. It is a special type of therapy because can be used to treat various non-life threatening conditions such as acute and chronic pain, insomnia, skin conditions, gastrointestinal issues, infertility, anxiety/depression, and many more. In addition to receiving acupuncture for a specific reason, all of my patients look forward to coming to the clinic because acupuncture is a therapeutic experience that results in relaxation and a sense of euphoria. Most people actually fall asleep during their treatment. The needles come in a sterilized package for a one-time usage only. Acupuncture needles are different from needles used when receiving an injection; they are as thin as a single strand of hair so the process is as comfortable as possible. The definition of acupuncture is simple: it is the insertion and penetration of needles into the skin. Acupuncture points are inserted into distinct locations along acupuncture channels. Acupuncture channels are like a street that make up a city and acupuncture points are houses located on the street. An acupuncturist develops a treatment plan and chooses precise acupuncture points that will assist with achieving a specific health outcome. Acupuncture and Traditional Chinese Medicine is one of the oldest forms of medicine to date and is still used by millions worldwide. The practice began over 3,000 years ago with the usage of sharp-edged stones to drain abscesses and ease pain. The medicine is a philosophical form of art that is based on 3 major pillars: Yin/Yang, Qi, and Five Elements. Yin and Yang represents opposite but complementary qualities. Yin contains Yang and Yang contains Yin; the 2 halves together equals wholeness. In Chinese Medicine, its physiology, pathology, diagnosis, and treatment can all be reduced to the basic and fundamental theory of Yin and Yang. There are 4 major treatment strategies aimed to balance Yin and Yang. Qi is basically the energy of everything. Exterior energy of air and internal energy of blood flow, metabolism, nerve impulses, etc. Qi assumes many different forms; it is transformed, changed, transported, condensed and dispersed. It enters, exits, rises and descends. The transformation of Qi are the essence of human Qi physiology. Qi energy is similar to an atom. Five Elements are qualities of nature: wood, fire, earth, metal, water. Each element is associated with an organ - liver, heart, spleen, lung and kidney. Five Element theory is a prime example of true holistic medicine; one organ is surely to affect another organ, therefore, the entire body is treated as a whole. Traditional Chinese Medicine is very different from Western medicine. The later focuses on one organ system at a time; if you have a heart condition, you see a cardiologist. If you have a skin condition, you see a dermatologist. Traditional Chinese Medicine is the exact opposite. When most people think of acupuncture, the primary thought is something that is mysterious and a little weird. It is to some extent, but it also has scientific basics behind how and why it works. Acupuncture stimulates endorphin release. Endorphins are natural neurotransmitters (produced by the central nervous system and the pituitary gland) that work as a chemical process to regulate and inhibit pain perception. Endorphins interact with the pain pathway at a certain location of the spinal cord (dorsal horn) and interferes with the action of another chemical called substance P. Substance P is like to opposite of endorphins, it helps carry pain signals to the brain. Endorphins block the action of substance P resulting in fewer pain impulses sent to the brain. Endorphins are similar to a best friend for our body. They regulate the degree of pain being felt which then allows our body to start recovering. Other ways endorphins are released is through exercise and laughter. In Chinese medicine, there's channels located on the body from top to bottom. On those channels are acupuncture points. When the body becomes sick, whether is it pain, infertility, or acid reflux, there is a belief that something is not balanced or something is stagnated, or not flowing like it should be. For example, when there is traffic build up on the expressway due to a stalled vehicle, the person driving a tow truck has to find the vehicle and remove it. Their job is to not only get the vehicle to an auto shop, but also clear traffic so that it is moving efficiently again. Acupuncturists are the same way. When there is something wrong with the body, we have to find out where it is and remove it. BUT there is one step that is different from a traffic jam and western medicine. We have to find out why the condition occurred in the first place, then proceed to proper treatment.